Congratulations to Carter Phillips, Winner of Event 31: $1,500 No Limit Hold'em ($664,130)! 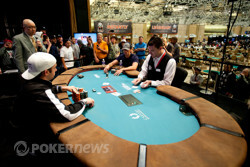 The largest $1,500 No Limit Hold'em event thus far at the 2012 World Series of Poker has officially reached its conclusion. After a long and grueling tug-of-war-eqsue heads up battle, Carter Phillips was able to defeat Joe Cada heads up to win his second World Series of Poker bracelet and $664,130 in first place prize money. 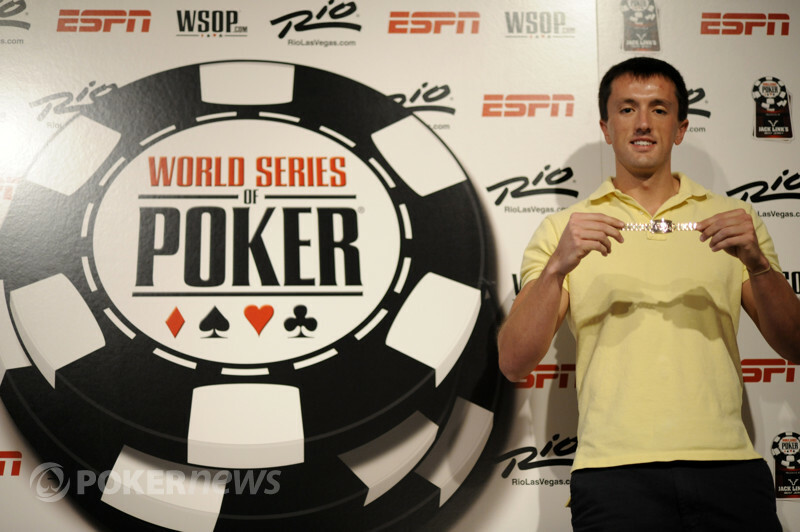 A mere three days ago 2,811 entrants put up $1,500 each in an attempt to earn WSOP glory. The eliminations came fast and furious on Day 1 as a slew of notable players became victims of this large field event. The likes of Viktor Blom, Greg Raymer, Kara Scott, Andy Frankenberger, Ana Marquez, David Williams, Melanie Weisner, Faraz Jaka, and Matt Affleck were unable to get anything going on Day 1. The field was whittled down to 331 players who came back on Day 2, 297 of which were able to make the money. Among those to cash in this tournament and find their eventual end during Day 2 were Nick Binger, Angel Guillen, Lauren Kling, Sean Getzwiller, Ted Forrest, Bernard Lee, Erika Moutinho, and PokerNews writer Chad Holloway. 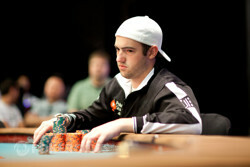 The story buzzing throughout the Rio on Day 3 was that of 2009 WSOP Main Event Champion Joe Cada. Cada finished Day 2 as the chip leader with 19 players remaining and had the opportunity to become the first Main Event winner of the past decade to win a second bracelet. However, by the time the final table was reached, Cada was the shortest stack of the final nine. Two of the more notable names to hit the rail on Day 3 and finish just shy of making a WSOP final table were JC Tran (12th) and Dwyte Pilgrim (11th). After two long hours of play, the final table final saw its first casualty. Cherish Andrews raised only to find Huy Quach move all in on her. Andrews called with pocket jacks and was racing with Quach's . Andrews was able to spike a jack on the flop and fill up on the turn, ensuring her a double up and absolutely crippling Quach. Quach was left with one t5,000 chips and was forced all in the next hand where he was eliminated at the hands of Jonathan Poche. Although he gave Quach his finishing blow, Poche was the next to go when he moved in preflop and was called by Joe Cada's . Poche faild to improve and was sent home in eighth place. 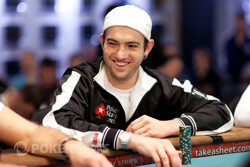 Soon after the dinner break Michael Aron was eliminated in seventh place. Aron moved all in with pocket threes only to find Joe Cada moved all in over the top with tens. The tens held and Aron was sent to the rail to collect his $85,043 seventh place paycheck. After Aron's bust, things started going crazy at the final table. Several doubles ups later, Maximilian Lehmanski was the next player all in and at risk. He moved all in from the hijack and was called by Carter Phillips. Lehmanski found no help on the flop of . The on the turn gave him a few more outs but he was eliminated when the struck the river. Lehmanski's elimination thrust us into five-handed play with Joe Cada atop the leader board. Cada continued to accumulate chips but it was Carter Phillips who played the aggressor during five-handed play. The field began to play more timid as blinds rose and a min-bet would usually take the pot down before the flop. Eventually, Najib Kamand moved all in preflop over top of a raise from Phillips. Tom Chambers moved all in over the top and Carter got out of the way. The two were racing with Chambers having the slight lead holding . Kamand's found no help on the board and he was eliminated. The last remaining woman in the field was the next to go. Cherish Andrews would bust in fourth place after getting it all in with pocket eights against the ace-king of Joe Cada. Andrews looked great when the flop came . The turn brought the and gave Cada a few more outs. As the tension grew in the room, the dealer peeled off the final card on the board. It was the and Cada's rail erupted into cheers while Andrews' fell utterly silent. Cada's wheel sent Andrews to the rail to collect her $210,083 in winnings. Immediately after, Tom Chambers got it all in with against Cada's . Cada's kings held and Chambers' elimination thrust us into heads up play between Joe Cada and Carter Phillips. This was not the first time these two have tangled on the felt, either. Back in 2010 both players made a deep run in the 2010 PokerStars Caribbean Adventure $25,000 High Roller event. Joe Cada was able to win a race and eliminate Carter Phillips in 12th place. Cada went on to finish 11th in this event. Cada started the match with a little more than a 2 to 1 chip lead but that was quickly relinquished when Cada moved all in with . Phillips called with the and was ahead going to the flop. Phillips then paired his queen while Cada failed to improve, effectively switching the chip positions of the players and giving Phillips the chip advantage. The two would then go on to trade the chip lead again and again over the course of more than two hours. Phillips managed to get Cada all in for his tournament life twice before the flop and Cada won the flips to survive in both instances. Later in the night, however, Phillips would deal the killing blow when he moved all in on the turn with the board reading . Cada called with but was drawing dead against Phillips' . Cada would then proceed to double up once before Phillips was finally able to close the deal. Phillips' was able to best Cada's during a preflop all in. Here at PokerNews we send our deepest congratulations to Carter Phillips on conquering a massive field to attain his second WSOP bracelet. That does it for our coverage of this event. Be sure to check out our WSOP Live Reporting page for updates on all of the other events this summer! Joe Cada went all in on the button for 1,350,000 and Carter Phillips called to take another shot at securing the win. The flop came down , offering very little help to Cada. The hit the turn, leaving Cada with only six outs to survive. Joe Cada's valiant attempt at bracelet #2 came up just short, but he'll earn $412,424 for his runner-up performance. Carter Phillips raised all in on the button and Joe Cada called all in for 665,000. The board ran out , giving Cada the double up with jacks full of nines. Joe Cada raised to 325,000 from the button and Carter Phillips three-bet to 810,000. Cada called and the flop was . Phillips led out for 425,000 and Cada flat called the two saw a turn of . Phillips pushed out 1,250,000, Cada moved all in and Carter called. Carter was the one all in and at risk before the cards were turned up. His all in was for 4,730,000 and he tabled for a turned set of nines. Cada showed and was drawing dead going to the river, guaranteeing Phillips a double up. The board completed with a and Carter scooped the pot, boosting him into a dominating chip lead. Joe Cada raised tom the button to 325,000 and Carter Phillips came over the top to 810,000. Cada would have none of that, however, and he pushed out a four-bet to 1,400,000. Phillips folded and Cada took it down. Carter Phillips opened to the standard 325,000 from the button. Joe Cade three-bet to 775,000 and Phillips went into the tank. Phillips moved out a four-bet to 1,525,000 and Cada quickly shot his hand to the muck. Joe Cada opened to 325,000 from the button and Carter Phillips called. The flop brought the , and the . This board prompted both players to check and the turned. Phillips fired 350,000 and Cada mucked his hand. Two hands later Cada made it 325,000 from the button and Phillips called once again. The flop was [4h} and Phillips checked to Cada. 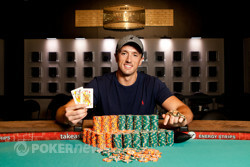 The Main Event champion pushed out 325,000 only to find Phillips raise it to 1,025,000. Cada thought for about thirty seconds before mucking his hand and giving the pot to Phillips. Carter Phillips opened to 325,000 and Joe Cada moved all in. Phillips called and the hands were tabled. The flop fell and Cada retained his lead. "I'm good with small pairs," said Cada to Phillips. The turn was the and the river the , giving Cada a double up with his deuces.